Shiromani Akali Dal continues to hold its own against the national party. In Punjab, it remains the dominant partner, unlike what happened with the BJP’s other old ally, the Shiv Sena, in Maharashtra. While they took their time finalising it, the BJP and Shiromani Akali Dal finally reached an agreement for the Lok Sabha elections as per their existing arrangement — the BJP settling for three seats, leaving the lion’s share of 10 to SAD. Their relationship is unique not only because SAD is one of the BJP’s oldest allies; it also continues to hold its own against the national party. In Punjab, it remains the dominant partner, unlike what happened with the BJP’s other old ally, the Shiv Sena, in Maharashtra. There are several reasons behind this. SAD first came close to the BJP’s precursor, Bharatiya Jan Sangh, during the coalition governments formed soon after Punjab and Haryana were carved out as separate states after the Punjab Reorganisation Act, 1966. According to the Director of the Chandigarh-based Institute for Development and Communication, Pramod Kumar, those governments were formed out of post-election coalitions and were “unstable marriages of convenience”. In the 1997 Assembly elections, SAD and BJP stitched together their first pre-poll coalition. Since then, they have been contesting both the Vidhan Sabha (SAD contests 94 seats and BJP 23 in the 117-member House) and Lok Sabha elections together. 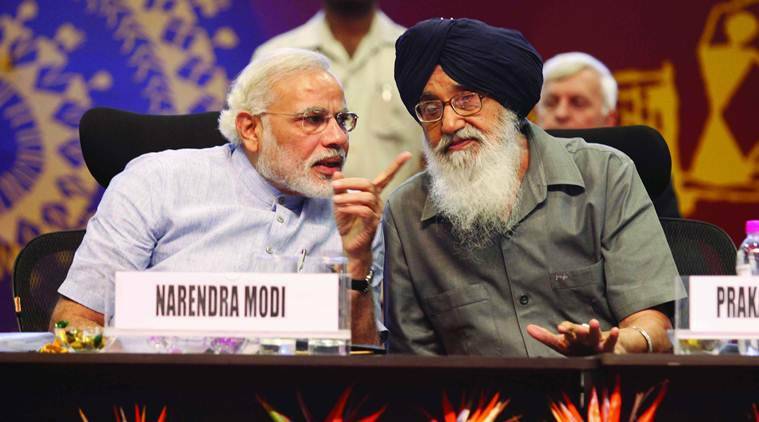 Many believe that Akali patriarch Parkash Singh Badal’s equation with the top BJP leadership and the respect he commands from them are two crucial factors in keeping the partners together. After a section of the SAD leadership had accused the Modi government last year of not treating its allies like Atal Bihari Vajpayee would, Badal Senior, in a subtle advice to visiting BJP chief Amit Shah in Chandigarh, had told him to “dispel the perception of insecurity among the minorities”. SAD also gains from the Hindu votes acquired through the BJP as there are many splinter Akali factions vying for the Jat Sikh vote. Communal harmony and peace have been the stock assertion of Badal Senior while praising the alliance. Another unifying force is believed to be former Punjab deputy chief minister Sukhbir Badal’s wife Harsimrat Kaur Badal, who is a Union minister in the Modi government. Harsimrat shares a good rapport with senior colleagues in the Modi-led government. Before the two parties announced their alliance, they had hit several rough patches. SAD had even boycotted the NDA meeting on the first day of the Budget Session in Parliament and threatened to walk out of the alliance. SAD had complained that the BJP government in Maharashtra was trying to gain control of the Takht Hazur Sahib in Nanded. This came soon after the Centre conferred the Padma Bhushan on SAD leader and Rajya Sabha MP Sukhdev Singh Dhindsa, who has been questioning Sukhbir’s leadership. 3 Samjhauta Express blast case explained: Who are the accused? What did NIA chargesheet say?